Some people may recoil in horror when they discover that this little lady knows how to operate a tractor. It was part of an invaluable traineeship when I worked for a year in a vineyard. I like the name behind the winery ‘Ten Minutes By Tractor’, although the notion of it taking ten minutes by tractor between vineyards is a questionable one. I say this because it would depend on whether you are cruising at the leisurely speed of an old lady or, if instead, you’re ‘fanging it’ illegally down the desolate back roads like someone (ahem) may have done in the past… perhaps for legalities sake, I’ll roll with the former. Ten Minutes By Tractor has been producing top quality Mornington Peninsula Pinot Noir and Chardonnay for just over a decade. Their three vineyards named Judd, Wallis and McCutcheon are only a short distance from one another yet display wonderfully different features. The Judd Pinot Noir runs a thick, savoury path with lots of earthy aromas, while the Wallis leans towards the spicier spectrum with a more mineral and crisp finish. In the end I found the wine produced from the McCutcheon vineyard to be the most ethereal and complete. It captured me with its dusty pink hue and Burgundy-esque tones, the dark and earthy spices interwoven with wild berries, topped with a crisp and refined grip on the finish. The McCutcheon Pinot Noir will continue to seduce over a couple of hours, so pour it into a big Burgundy glass and serve it alongside suckling pig, mustard and truffle jus, roasted vegetables and crackling. Well, that is what they did at the winery’s restaurant and boy oh boy it worked a charm. Available through independent wine retailers. The Jamsheed name was derived from an endearing tale drawn from ancient writings of a Persian king. King Jamsheed was fond of fresh grapes and would store them in jars over the winter where they would spontaneously ferment. He set these jars aside and labeled them ‘poison’. One of the women from the King’s harem, despairing of frequent migraines, chose to commit suicide and drank from one of the poisoned jars. Awakening the next day, she found herself miraculously cured of her migraines and informed the king of the natural powers within his jars. The King was so pleased that he set about making many jars of ‘poison’. This is just one story of how wine was discovered. Winemaker Gary Mills has adhered to the ‘natural powers’ worshipped by King Jamsheed with the La Syrah 2011 forming part of Jamsheed’s Harem Series. This unfined and unfiltered wine is a multi-regional blend from two cool-climate Victorian regions – the Yarra Valley and the Pyrenees. There are not a lot of wines under $25 that beg for a decent decant prior to drinking but this is one of those rare occasions when the wine will benefit from a good slosh of air. After a little air, interesting tart pink grapefruit notes become discernible followed by plump purple fruits. These flavours are accentuated by the fact that this has had 80% whole bunches of grapes in the ferment. 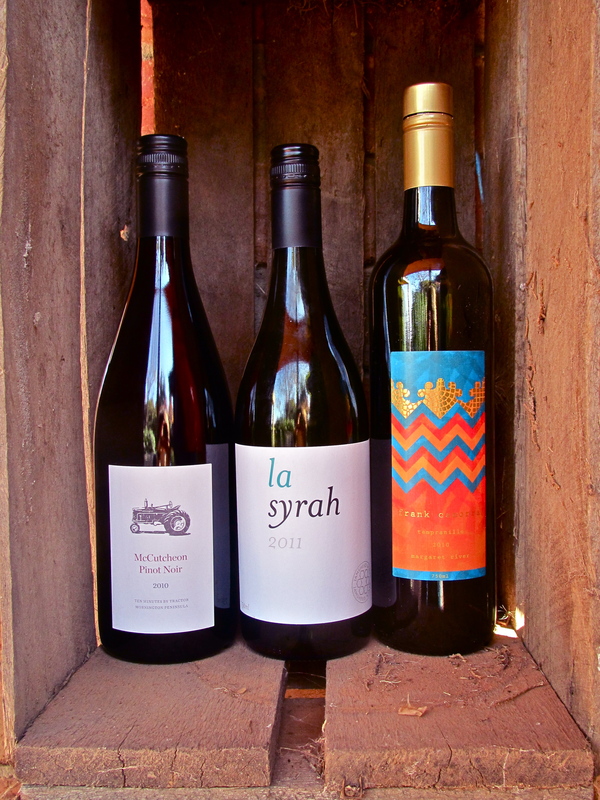 It’s spicy and sappy, fresh and raw, and if the tale runs true, La Syrah could be the breakthrough cure that migraine sufferers have been looking for. Available at Randall’s Wine Merchant and Wine House. Just when you thought celebrity chefs have enough restaurants, cookbooks, television appearances and supermarket promotions under their belt, you are proven wrong. This time, they’re taking over the winery! OK, that’s an exaggeration, but they have been approached by the Wine Selectors group to put their names to a collection of wines made around Australia that will pair nicely alongside their style of food. It’s a nice idea to encourage the concept of food and wine matching to a wider audience. Take Mr Frank Camorra and his robust Spanish menu of MoVida fame. Tempranillo is unarguably a natural partner for his elegant yet bold Spanish cuisine. This native Spanish grape is popularly grown in a number of regions in Australia. In this particular case, we are looking at Margaret River. This wine possesses that tarry, gravelly tannic grip you like to see in a Tempranillo complemented by earthy, plum flavours and a bright, balanced acidity. The mid-length finish falls a little short of making this a big blockbuster style, but that also means it sits comfortably with a wide range of dishes that you will discover during a visit to MoVida. This wine is served in the MoVida restaurants or is available through Wine Selectors.